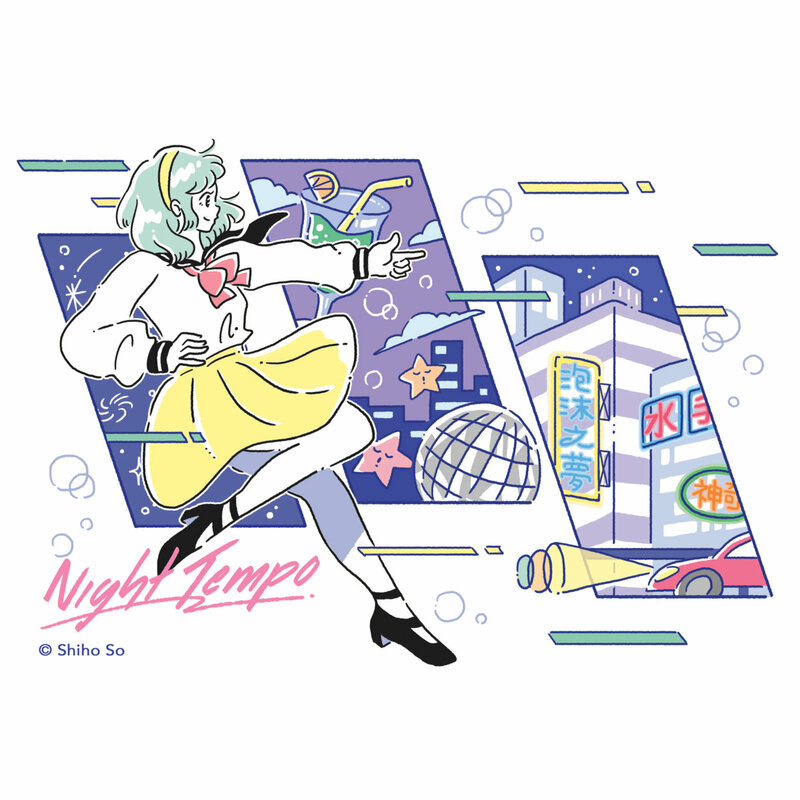 Home / -Album Review / Outside In(fluence): Night Tempo - "Nighty Tape"
Outside In(fluence): Night Tempo - "Nighty Tape"
This week on Outside In(fluence), I present to you Nighty Tape by Night Tempo out of Seoul, South Korea. As I have been doing recently, I discovered this tape by browsing thru Bandcamp; it was one of the most listened to albums. Night Temp is just one dude with nearly 9,000 likes on Facebook. I wish I could get that many for Skull Valley! Maybe I need to ditch my aesthetic for #aesthetic, and use some old-school anime imagery. Nighty Tape's cover art is exactly that - an image of a green-haired Japanese schoolgirl in an old-school anime style. It has a nice palette of pale colors, predominantly blue. There's some other stuff you might expect from this kind of vaporwave design - a colorful drink, starfish, a disco ball, and images of a city. I feel so nostalgic for this stuff, and I always like seeing it. It's perfect for the sounds of the album. Nighty Tape is a long album. Now, it's only two tracks, one per side, but these tracks are both over 40 minutes. Side one is labeled "Night Side". It starts with a funky R&B bass and cool guitar soloing all encompassed by a harsh tremolo effect (really I think it's just the way the bass drum is mixed). Later the track moves into a crystal sound with chorus backing vocals while retaining that dance sound before returning to R&B bass drum/tremolo land. The track continues to change as it goes, retaining overall the same feel of vaporwave Sega Saturn anime OVA sounds utilizing saxophones, guitars, keyboards, chimes, the odd vocal, and copious amounts of reverb and chorus. The second side is entitled, "Tempo Side". "Tempo Side" starts with jazz/swing Sinatra sound, still utilizing the same production techniques heard in "Night Side". This side seems a bit more complex, with pulsating bass and ricocheting guitars. Everything still follows in the future funk/vaporwave/jazz fusion feel though. Some more interesting parts on this side are some weird reverse vocals, strings, and more prominent vocals. I also really enjoyed the fading effect at the end. Otherwise, it's not much different than the first side. Nighty Tape is a pretty cool vaporwave album. I really enjoyed listening to it, but, as with much of this genre, it plays better in the background. The production if kind of harsh, though it replicates the kind of sounds you might hear on an old cassette tape. The beats hit fairly hard, while everything, including those harsh beats, is very floaty on air. I liked the various instruments used, from keyboards to saxophones to guitar. I am excited to get some of the new merch being released by Night Tempo, but it isn't out yet. Everything is all very fashionable. Nighty Tape gets a Good.